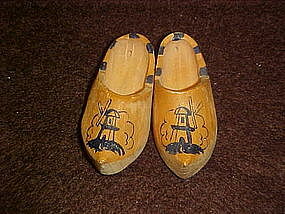 A little hand carved pair of shoues from Holland. Measures just 2 1/2" long. In the back of each one is a tiny hole where they were once strung together with a thread, THere is a windmill on each one and each says HOLLAND near the bottom.